Rupert Jackson, Strachan's favoured nephew (son of Marth Hulley the second wife of William Jackson), wanted a piece of the trading store action and an agreement was entered into in which he had a 50% share in the profits of a trading store that he ran that was set up at Mountain Home. To identify the store and its coins from the other stores in the group the small number of currency tokens used there were struck with the letters "MH". The "MH" tokens were accepted at a Strachan store and the Mountain Home store accepted the other S&Co tokens - later exchanging them by value to "balance the books". Only about one hundred of each denomination of the S&Co "MH" tokens were struck for the store making these token coins extremely rare and the most sought after of the S&Co coins. I am unaware of any of these extremely rare tokens ever being auctioned on the Internet. Ken Strachan told me that his grandfather, Donald Strachan, during a land buying spree in 1876 acquired the farm Mountain Home from Bishop Henry Callaway. "...For the S & Co. tokens to be “South Africa’s first indigenous currency that circulated over a vast geographical area”, they must have been introduced before 1892 and circulated widely before that date..."
We still do not know when they were introduced but we are 100% sure that they did not circulate widely before that date. “"...Before the year 1892, Strachan & Co. only had three shops being the Main Store at Umzimkulu, and the Ibisi and Mountain Home stores, the last two stores being opened in the second half of the 1880s. Were these three S & Co. stores situated (spaced) over a wide geographical area? No, certainly not. 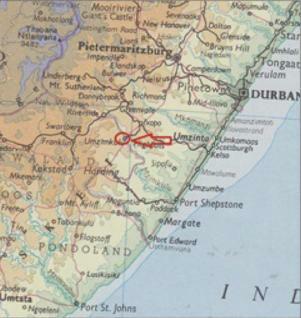 The Mountain Home store was only 9 miles from the Umzimkulu drift, and the Ibisi store even nearer”..."
The Mountain Home Store was only opened in 1904 and NOT in the second half of the 1880s as we though it did and certainly not in 1878 as the Wikipedia suggests. That only leaves the Main Store and the Inbisi store in operation before 1904. Now the area the S & Co tokens could have circulated in before 1904 shrinks to almost shouting distance. Where does this new information comes from regarding the Mountain Home store opening up 20 years AFTER many of us thought it did? "...In 1874 Bishop Henry Callaway bought the farm Riverbank from the Griqua government. Callaway sold this farm to Donald Strachan in order to raise funds for the Clydesdale Mission Station. Strachan later swopped this farm for Mountain Home and Riverbank became part of the Mfulamuhle location. It seems that the store was only built in 1904 when Rupert went into partnership with Donald Strachan. From 1904 to 1907 Strachan & Co. went through a period of rapid expansion and bought or opened 6 new stores in a three year period – Mountain Home, Singisi, Gugwini, Mahobe, Cabane and Waterfall..."
Snell thus tells us that the Mountain Home tokens must have been struck sometime between 1904 and 1927. The Mountain Home (MH) tokens were the second series issued by S & Co. That leaves us with only the first series of tokens (Series A) that could only have been used before 1904 – and then only at two S & Co stores situated almost shouting distance from each other. Yes, they could have been introduced before 1892 but there is no hope in hell that they could have circulated then in an area that is larger than that covered by a modern international airport or a large farm in those days. Should any of the men whose accounts you are dealing with tender any of our tokens in payment will you please accept them at the face value i.e. 3d, 6d, 1/-, and 2/-, as the case may be. All are brass and stamped S & Co above the market value as these tokens are to be accepted only in payment of our accounts. Balson and Graham point out that the letter makes no reference to the inscription “In Goods”. This is either because he was referring to the Type A tokens or it was unnecessary as Rieher was emphasizing the identification marks. Now that we know Rupert Jackson only moved to Mountain Home in 1904, we can conclude that the tokens described in the letter were the Type A trade tokens. So, as late as 1907, the Strachan Company still has to describe to a business associate and longtime resident of the area how the first set of S & Co tokens look. This is almost unbelievable - F.L. Thring, a lawyer in the area (and a S & Co business associate) who has been living there for 20 years, had no clue how to recognize the tokens (how they looked). We are talking about the series A - the first set - of S & Co tokens - and that was in the year 1907! In his book Coins and Tokens of the British Empire published in 1889, James Atkins, records many South African Tokens (i.e. the Griqua coinage, Durban Club, Marsh & Sons, J.W. Irwin, Whyte & Co.) but makes no mention of any Strachan and Co. tokens at all. But hold your breath … Wikipedia tells us the second series of S & Co tokens were issued in 1878. Can anyone believe this absolute nonsense? We now know that Dr. Theron was most probably correct when he told us that the very FIRST set of S & Co tokens were (at the very earliest) only issued at the turn of the 19th century (say late 1890s or early 1900s). And James Atkins would probably have agreed as by the year 1889 there was NOTHING known or written about them. I would date the first set of S & Co tokens to the Boer War years (1899-1902) but even if they were issued before that date, would guess that they circulated in an area as large as the area Table Mountain covers. Why not keep your million and get Wikipedia changed? There are a few contributors to this forum who have tried (including myself) to correct the nonsense written on Wikipedia regarding our South African coin heritage. But as soon as we change it, the Wikipedia moderator deletes our contributions and change it back to the same old lies we have been fed since way back when. The answer is to get the South African National Numismatic Society to contact Wikipedia and set the record strait. The wheel turns slowly, but eventually the truth will be known. I could bet a million rand that no S & Co tokens where issued in the 1870s, a R100 000 that no S & Co tokens were issued in the 1880s, and a “token” amount if they were issued in the 1890s. The S & Co tokens are a brass embarrassment to dating them to Victorian times. A million rands and still no takers after how many weeks? NOTE: The comments below regarding when the the Mountain Home set (set two) were released in the linked PDF are thanks to the research by Milner Snell undertaken in 2016. Type A (S&Co) were released c1874. Type D ("In Goods" new set) issued later in the 1920s. We know the first set (S&Co) were minted c1874 as we have Douglas Strachan's diary note confirming this fact and Standard Bank's 125th Anniverasary PDF (published in 2003) confirming the S&Co were circulated widely in the Kokstad region when they first came there in 1878 (see page two). Thanks to Milner Snell for his input on this pivotal set - the Mountain Home (type B - S&Co MH). This research greatly increases the length of time the S&Co were in use as currency tokens throughout East Griqualand (ie the extended period without a reference to "In Goods"). You were the first person I sent the findings to. The crux of my findings is that the Mountain Home tokens came out soon after 1904. 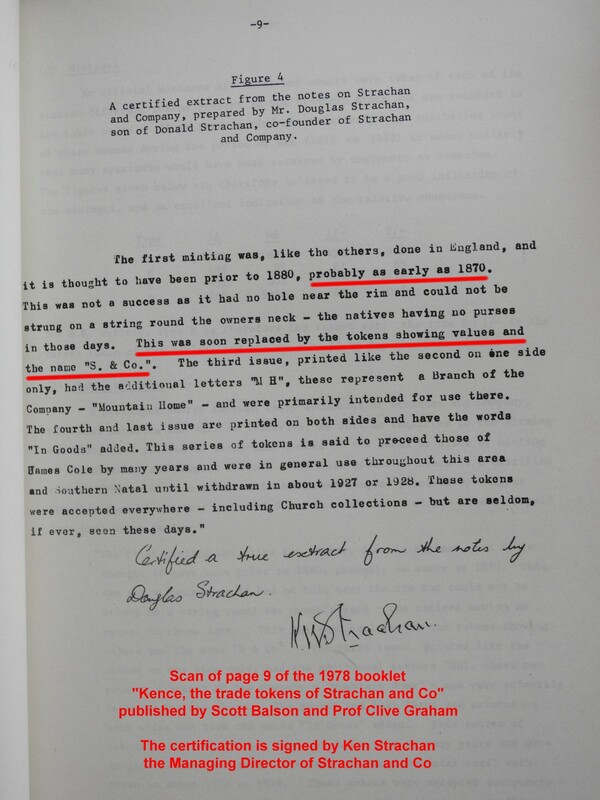 I do not imply that the 1907 letter was introducing the tokens to Thring or the region but rather it referred to tokens already in use, but perhaps it should have been made clearer. My understanding is the farm was bought or resurveyed in the 1870s and the store built later. Does anyone see what has happened here? After years and years of implying the 2nd set dates from the 1870s, it now suddenly dates from the 1900s - Kan jy nou meer! This claim is based on a booklet produced by the Standard Bank in Kokstad in 2003 to commemorate the branch's 125th anniversary. The booklet notes that the S & Co. tokens were used by the Griquas in Griqualand East. That is all the booklet is saying. No contemporary records exist of Standard Bank ever referring to the S & Co. tokens at all. Why would they? If the first set of S & Co tokens circulated at all by the turn of the century (1899-1901) it could only be at two S & Co stores situated almost shouting distance from each other. The size of IRELAND (according to the well known Wikipedia Source) is what the Strachan and Co Tokens could have circulated in during the 1800s. "Ken Strachan Managing Director of Strachan and Co confirm date of 1874". Wikipidia says that Prof Graham (long dead) is saying that Ken Strachan said that Douglas Strachan said that Donald Strachan said that they were issued in the 1800s. The document was obviously rendered for signature before an ailing (he could hardly write anymore - see his signature) how-many-generations apart Strachan whose father (not even his grandfather) was not even born when the nonsense date of 1874 is presented.